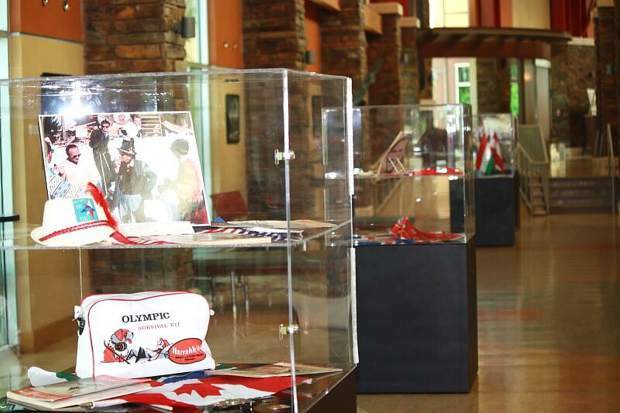 An exhibit of artifacts from the 1960 Squaw Valley Winter Olympics will be on display at the Truckee Community Recreation Center from now until the end of September. The Truckee Public Arts Commission is hosting a new exhibit at the Truckee Community Recreation Center that displays a variety of art and artifacts from the 1960 Squaw Valley Winter Olympics. The exhibit showcases memorabilia on loan from the Squaw Valley Ski Museum Foundation. The displays include rarely seen photography of the 1960 Winter Olympics from the private collection of Olympic photographer Bill Briner. Other Olympic memorabilia including flags, uniforms, banners, pins, publications and more, are on display from the private collection of Dr. Stan and Maryann Batiste and the private collection of David Antonucci. These items are on loan from the Museum of Sierra Ski History and 1960 Winter Olympics in Tahoe City. The exhibit will be on display at the Truckee Community Recreation Center from now until the end of September. The exhibit is free to the public, and information cards describe the proposed Sierra Nevada Olympic and Winter Sports Museum and ways to donate and become involved. For more information about the Squaw Valley Ski Museum Foundation and the proposed Sierra Nevada Olympic and Winter Sports Museum, visit olympicskimuseum.org. The Truckee Public Arts Commission (TPAC) builds community through collaboration, promotion and advocacy for public art. For more information visit TDRPD.org or follow TPAC on Facebook and Instagram.